It’s difficult for me to get as far west as Clearwater Bay, and the cancellation of today’s flight test, which could have taken us out over the lake at a good altitude, is a lost opportunity to get pictures in that direction. Here are some photographs of Deception Bay contributed by David Reid. He sent them to me yesterday, and I think that is the day they were taken. Click on them to see them full-screen. 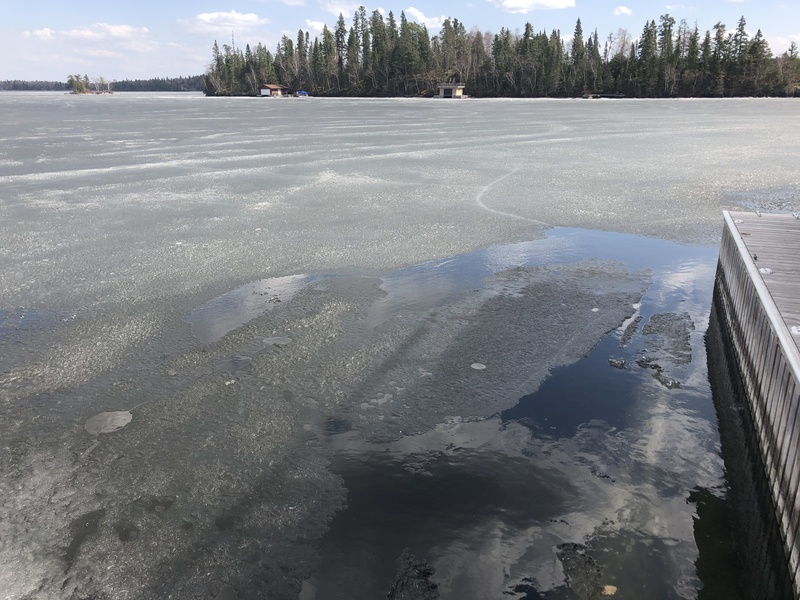 David says: Lots of shore line has melted… ice is very dark. Little Deception will probably be water in 4-6 days, Big Deception a little after. I’m hoping some of my airline friends will be able to snap pictures in the Clearwater and Shoal Lake area soon, but they can’t help when it’s cloudy. Today’s photo opportunities didn’t work out as well as I had hoped. 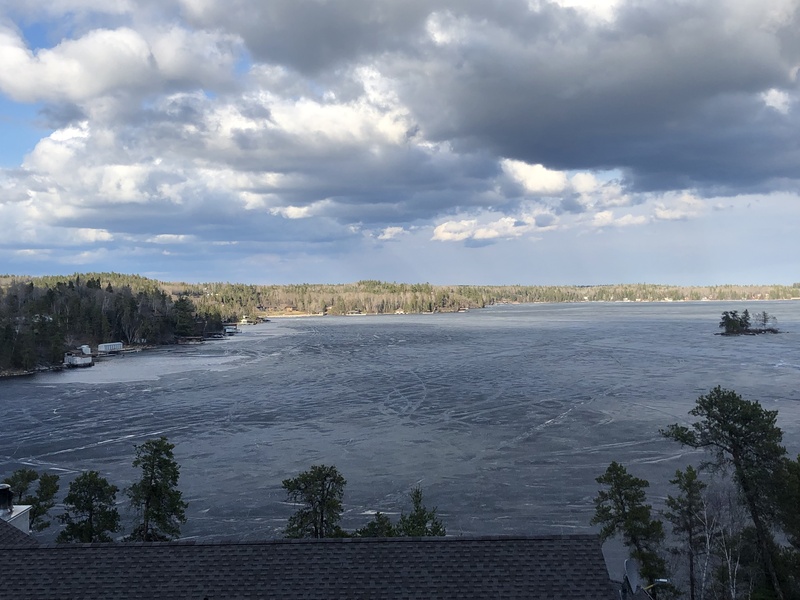 By the time we came home this afternoon, it was turning cloudy, casting huge patches of shadow on the lake and making it hard to tell what was water and what was ice. Worse, it was trying to snow, and it was very gusty. We gave up and concentrated on landing. But there is some good news; I did get a few pictures today. Because I have a new phone, (a Samsung Galaxy S10e) with a new camera, I took some test shots this morning to break it in and get a feel for how it works. The nose of the aircraft is prominent in these pictures because we’re climbing quite steeply. This first shot was taken using the wide angle lens*. It’s a bit too much, I think, and it looks a little blurry, although that could have been due to turbulence. But check out Rabbit Lake to the right of centre, or Laurenson’s Lake, partly blocked by the windshield wiper arm. Both have turned very dark, and the east end of Laurenson’s, under the wiper, is melted. *The wide angle lens does not shoot a picture with an aspect ratio like this: I’ve cropped out a whole lot of sky and dashboard from the top and bottom. It does include a wide span of terrain, though. That greyish smudge at the right is a bug-strike on the windshield. Sign of spring. As usual, you can click on these pictures to see a full-screen version that can be zoomed to full resolution. Using the regular lens, here’s the standard Rat Portage Bay and Safety Bay shot. As we turned left, Bare Point and Middle Island came into view. There are watery patches between Bare Point and Lunny’s Island now, and you can see how the water by Town Island, off the nose of the King Air, is expanding and reaching towards Scotty Island. A little further left, and you can see most of Hay Island as well. Left of the nose, you can see Quarry Island, Queen Bee, Chien d’Or and Burley Islands. No water in that area yet, but zoom in and look at the Barrier Islands behind Middle Island (right in front of the plane’s nose): the water at The Elbow has expanded a lot. I didn’t take many pictures this morning because I was more interested in what we’d see this afternoon. Then the weather turned poor on us, and I decided to wait for Friday morning. So of course I got word this evening that my Friday flight, a pilot “check ride,” has been cancelled. Before I go, I should talk about the weather forecast a little. The snow we flew through this afternoon didn’t reach the ground, but it was the vanguard of a cold air mass. The temperature tonight is forecast to sink to 0ºC, and although we should limp back up to about 10ºC tomorrow afternoon, we can then expect several days of single-digit highs and lows sinking to around -2ºC. Those temperatures are about 5º below normal for late April, and that’s likely to put a damper on things. The lake will continue to thaw, but not at the same rate we’ve been enjoying since the middle of the month. I’ll be talking to Ted Burton at 89.5 The Lake tomorrow morning just after 8:00. Here are a couple of pictures from Tuesday, showing how much conditions have changed at Clearwater. 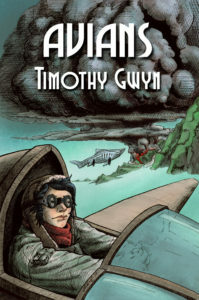 They were contributed by Thomas Taylor. I don’t have time to write much about them this morning; I have to go to work. I got some new photographs this morning. Lake ice continues to weaken all over. Tech note: For the last few years, I have taken pictures with my trusty smartphone, a Samsung Galaxy 5 Neo. This winter, some dust got inside the lens, and there have been black specks on the pictures ever since. It was often possible to crop them out on the Ice Patrol photos, but I have been wanting to address the issue. Starting tomorrow, photographs will be taken using a new phone, a Samsung Galaxy S10e. First up, a familiar shot: Rat Portage Bay and Safety Bay. If we take off on Runway 26, this is what we see soon after departure. This time, I’ve included Laurenson’s Lake. 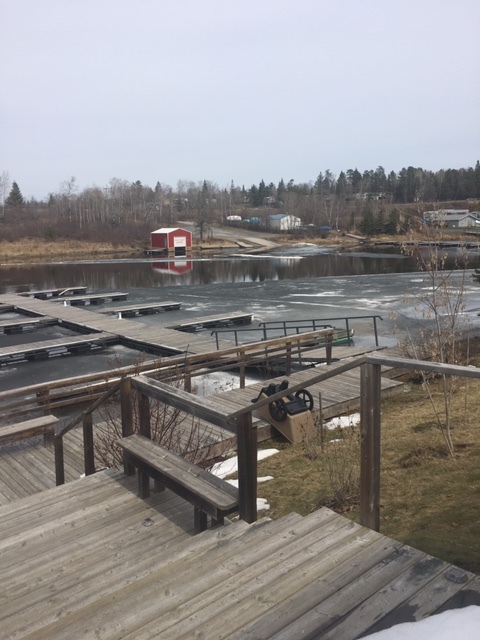 All three of Kenora’s suburban lakes—Rabbit Lake, Round Lake and Laurenson’s Lake—are darkening fast. Over on Rat Portage Bay and Safety Bay, water is eating away at the weakening ice. Here’s a look at Devil’s Gap and Treaty Island. Although the ice roads are still visible as relatively strong lines, the ice appears to be rotting over wide areas now. As Devil’s Gap went behind the wing, we were able to photograph more of the area around Town Island. This looks west over Matheson Bay, and clearly shows Rogers Island, just in front of the wingtip, then Galt Island, Gordon Island and Town Island. Now a shot from further away that includes a bit more territory. This picture includes not only Matheson Bay in the centre foreground, but also Bare Point and part of Bald Indian Bay to the left. Beyond Bare Point is Lunny Island, and beyond that Middle Island and Scotty Island are in the middle distance. As we turned east, we caught this view of Northern Harbour and Longbow Lake. Pine Portage Bay is half hidden behind the nose of the aircraft, but it’s all frozen, as is Longbow Lake. With the sun shining on the ice, it wasn’t as easy to judge the colour or condition of the ice here. I didn’t fly today, so I’m catching up on some graphs and predictions. First, an updated graph from Sean C. You can click on it to see it full-screen. The blue line with the plot points tracks our actual daily mean temperatures so far. The yellow line is based on weather forecasts. In theory, this is the path that the blue line will follow, but it gets less reliable the further into the future you look. The solid red line represents a warm spring that racked up lots of high daily mean temperatures in a short time. It’s sort of a best-case line. The solid green line represents a cool spring that took a long time to deliver a decent amount of heat. This is more of a worst-case scenario. The horizontal dotted red line represents our goal for this year, a thaw index of 240. As each day’s mean temperature gets added to the blue line, we rise towards that goal. The target index of 240 points is based on last year because the winter conditions were very similar as to both the length of the winter and the depth of the cold. The vertical dotted red line indicates a date we might make it by. It was set to May 17th when this graph was first created, but we’ve already started to improve on that. 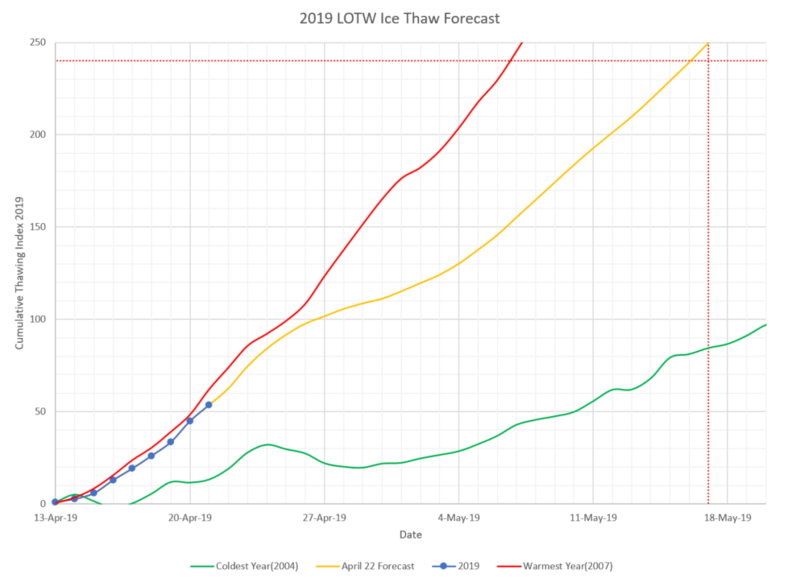 We might have an easier thaw if last winter’s frequent snowfalls degraded the quality of the ice compared to 2018. Soft ice wouldn’t require as many warm days to melt, so we could do it with less than 240 points. Here’s a graph I made, using data provided by Sean, but presented in a different way. It’s wide, so you should probably click on this one to see it clearly. 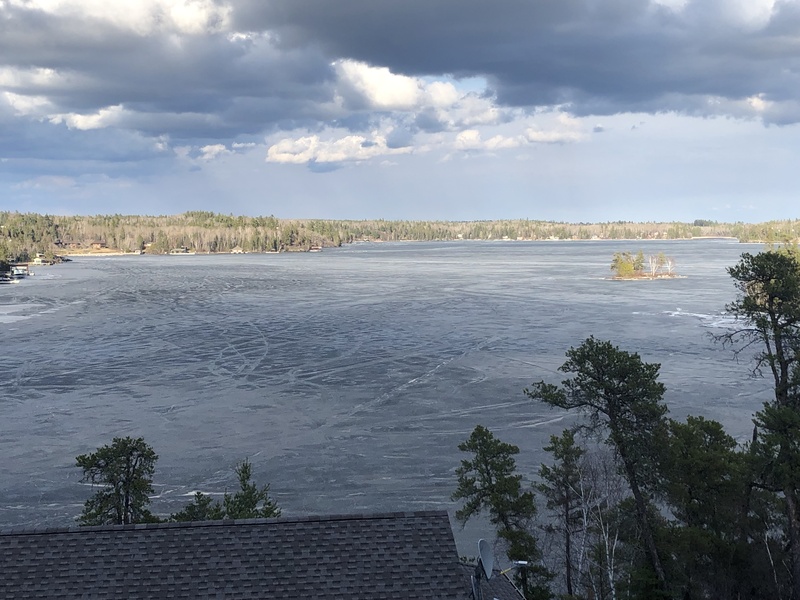 I’ve given each year a horizontal bar that starts on the inflection date (when the mean daily temperature rose above freezing on a lasting basis) and ends on the day Lake of the Woods was ice-free. The most recent year is at the top, and the oldest year (2008) is at the bottom. Rather than line up all the inflection dates at the left edge, I displayed them on a calendar base, because a May thaw is apt to apt to get more hot days than a March one. You can see this: the lines that start really early run longer than the ones that start late. Now it happens that our inflection date this year was April 13th, the same as 2016. I’m confident that this thaw will take at least as long as 2016’s, which ended on May 4th, so this year’s bar is solid blue up to that date. Realistically, there’s little chance of getting off that easy. 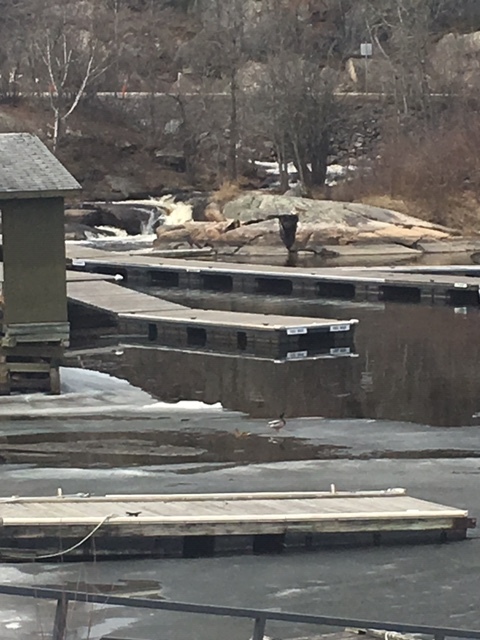 The winter of 2015/2016 was a mild one, and the ice didn’t put up much of a fight. I’ve tentatively shown a longer period of uncertainty in pale blue. I ran that out to as late as May 17th. That’s to match the prediction from Sean’s graph. I’m really hoping that’s on the pessimistic side. I didn’t have the heart to project anything worse. It might be possible to be ice-free around the middle of the range—May 10th or 11th—if we thaw as fast as last year. We’re doing well in that regard right now, but there’s cooler weather forecast for the weekend and next week that could slow things down again. The final result may depend on two basic things: how much ice we can melt during our current warm spell, and how that forecast cooler weather plays out. There are also two wild cards: rain and wind. Rain has an enormous capacity to deliver heat energy deep into ice if there are cracks. Wind can do violent damage to ice sheets once there’s open water in contact with them. I really didn’t expect to get any usable pictures on this evening’s night training flight, but we started at around sunset and had a few minutes of twilight before it got too dark. The first photo is a near duplicate of the Rat Portage Bay picture I took in the morning. Eleven hours later, the sun is reflecting off the water, giving strong contrast. I was able to get favourable light on the islands around Yacht Club Island, so you can clearly see the open water extending from Keewatin Channel all the way into Safety Bay. Not as well lit, but still visible if you click to zoom in, the subtly shining water in The Tangle. Then, something I didn’t expect. This next picture is a close match to this morning’s shot of White Partridge Bay. But there’s something new. As the last sunlight slanted across the ice, it reflected off dozens of little patches of open water. I’m sure those weren’t there this morning. I couldn’t get them all to light up at the same time, but I counted over twenty little glints as we flew past. Some of them might only be surface water on top of ice, but even if that’s so, this is a spectacular change in less than twelve hours. 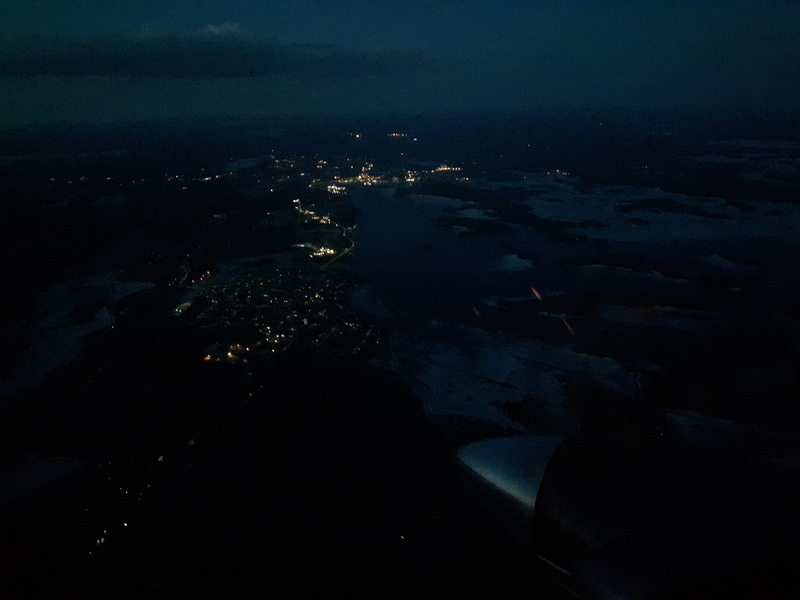 Next, we flew east towards Sioux Narrows. With the sun behind us, the lighting was less helpful. Still, you can make out the water in Whitefish Narrows in this picture of Long Bay and Whitefish Bay. Our last ice photo was this one taken facing the sunset from over Andrew Bay. Right in the middle of the picture is the scrap of water between Middle Island and Strawberry Island. Beyond that is Scotty Island and the shining water flowing into Keewatin Channel and Safety Bay. Queer Island is at the lower left, Railroad Island is above and to the right of it, Hay Island fills the lower right corner. And then it was dark. This is the waterfront looking east from Keewatin to Kenora in the distance. Today I got a chance to see how the warm weekend affected the lake ice. Lets start downtown, looking west at Rat Portage Bay. Rat Portage Bay is in the middle of the picture, and at last the open water is pushing in from Devil’s Gap. Gun Club Island is still surrounded by ice, but it looks much blotchier than last week. Safety Bay, at the right, is almost entirely open now. There was still some candled ice when I drove along the waterfront earlier this morning, so I think things are changing rapidly there. Click on any of these pictures to see a full-screen, zoomable version. Aiming the camera a little to the left, I was able to include Town Island in the view. Treaty Island has shifted from the left side of the picture to the right, so if you start with Rogers Island near the middle, you can work left to look at Galt Island and Town Island. Click to zoom in, and you can see that the water around Town Island is expanding towards Scotty Island, at the left by the windshield wiper arm. Now, my first look at the Ptarmigan Bay area. The Northern Peninsula dominates this picture, with White Partridge Bay in the foreground, near the dashboard. Follow that up the right side of the frame to look at Clearwater Bay. Ptarmigan Bay is on the left, with Fox Island just above the aircraft’s nose. I don’t see any water in this area yet, but the ice is darkening. We turned left, to look eastward over the Manitou. Whisky Island is at the bottom, left of center. Further back and close to the left edge is Scotty Island, with Middle Island and Hay Island behind it. Over on the right is The Elbow, with the open water between Mather Island and Allie Island spreading towards Queer Island. Here’s the same area, but looking north east. The Barrier Islands, with Shammis Island at the left, by the propeller blade, then Mathis Island, The Elbow, Allie Island and East Allie Island. In the back row, beyond Andrew Bay: Scotty Island, Middle Island, The Hades, and Hay Island. Last, a check on Big Narrows. Looking south west. Wiley Bay reaches to the right edge, and Wiley Point is close to the middle of the frame, with Big Narrows behind it. Zoom in to see Tranquil Channel and French Portage Narrows. Part of Queen Island is at the lower left corner. Summary: four or five days of warm weather have enabled areas with current to open significantly. Places with less current, such as Ptarmigan, Clearwater and Bigstone, have seen less dramatic progress, but the ice is darkening all over. We’re still doing better than last year, but this is the week when things started to warm up in 2018, bringing late but rapid change. Can we match that pace this year? Multiple forecasts (The Weather Network, Accuweather, Environment Canada, and even the Weather Underground) all agree that we’ll have a few more days of warmth, and then, as we get to the weekend, it will cool off. Opinion is divided on how cool and how long it will last. Some overnight lows a little below freezing seem likely, while a stretch of single-digit daytime highs may last for a few days, or several. If the more pessimistic forecasts turn out to be right, we could still come close to a thaw as late as last year. (Totally ice-free on May 14th). If we we don’t get too cool for too long, and benefit from some rain, we could continue to make good progress.